It’s all too easy to say you like Richard Thompson’s music, but in my opinion it’s impossible to like everything he has recorded. Personally, I never liked Fairport Convention; but loved quite a bit of his songs with his ex-wife Linda Thompson and in later years I’ve run a mile from Thompson’s more worthy Folk recordings, yet Rumour and Sigh is in my Top 10 albums of all time. Thompson is probably best known these days for his guitar playing and the opening bars of Salford Sunday are simply divine and the lyrics, themselves could easily have been by Morrissey when the Smiths were at the top of their game. Possibly not to everyone’s taste but the atmospheric My Enemy should become a Thompson classic and be talked about in pubs and clubs for decades to come. The quirky and commercial Good Things Happen to Bad People will no doubt get plenty of deserved airplay; as Americana producer Buddy Miller takes Thompson down yet another dark path and brings out the very best from the Folk Maestro. The gently strummed acoustic guitar on Snow Goose is Richard Thompson at his very, very best and the fractured love song that features Alison Krauss on harmonies; will send shivers down your back and bring tears to your eyes before it ends. 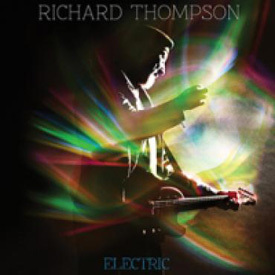 ELECTRIC ends with a signature Richard Thompson song; the haunting and Bluegrass tinged Saving the Good Stuff for Youwhich would have been the best track on any of his last seven albums; but is only part of a Master-work here. If you are early you can buy a deluxe version of ELECTRIC that includes a second seven track album that features songs that could and should have been included in the original disc. Opener Will You Dance Charlie Boy is Thompson and friends having great fun on a fast and furious jig that will no doubt be a feature of any future concerts. Why The Tic-Tac Man was left off the ‘proper’ album I’ll never know, as it is a truly great Folk Song and typical of Thompson; who has found a tiny character from Britain’s vast catalogue of characters and romanticized him in a way few others can match. As I said in my introduction this, for me is Richard Thompson’s best and finest work since 1991 and all of the way through he sounds like he believes that too; but don’t be fooled by the title ELECTRIC as it isn’t all electric guitar by any stretch of the imagination, so perhaps ECLECTIC would have been a better title.